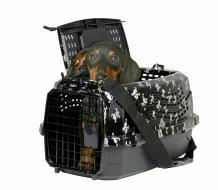 The double door design makes it easy to place and remove pets from the carrier. The top door opens both width and long ways and is fully removable. The shoulder strap makes transport easy and convenient. This carrier is airline compatible.